Similar to wedding season, Easter is a great excuse to buy a new dress (or separates), especially if you can find a piece or two that will take you through summer and all the events that come with it. We like to keep our Easter outfits light, bright and floral, with a little lace thrown in - which keeps things festive and fun - and of course, on trend for the season. Graphic prints, floral or otherwise, are all over dresses right now, making it easy to find an Easter appropriate outfit. It also wouldn't be a spring 2016 dress if there wasn't a white option, be it crochet, eyelet or linen, you'll find the perfect white dress for you. From L to R: Red Valentino cotton eyelet lace dress, Paul Smith cotton dress, Derek Lam 10 Crosby cotton top with lace trim, Theory "Raoka" floral print pants, M Missoni dress, L'Agence "T Lee" silk blouse and "Mackenzie" skirt. Whether you're doing a low key brunch with friends, attending mass, a party at the club or sticking around the house for a drizzly egg hunt with the kids, we've got a look for you. Although it doesn't feel like spring yet - hello, surprise snow storm - we're getting stocked (and stoked) for warmer weather in the store. With every shipment comes more flirty dresses, bright colors and floral prints and we couldn't be more ready. Even if the pieces your purchasing for the upcoming season don't seem practical for the weather outside, it's hard to resist wearing a new item in your closet. Rather than wait until the temps rise dramatically, it may take months after all, layer your new, spring-y pieces under chunky sweaters and scarves or over textured tights and long sleeve shirts. You'll get more use out of your new clothes, while staying cozy against the chill. 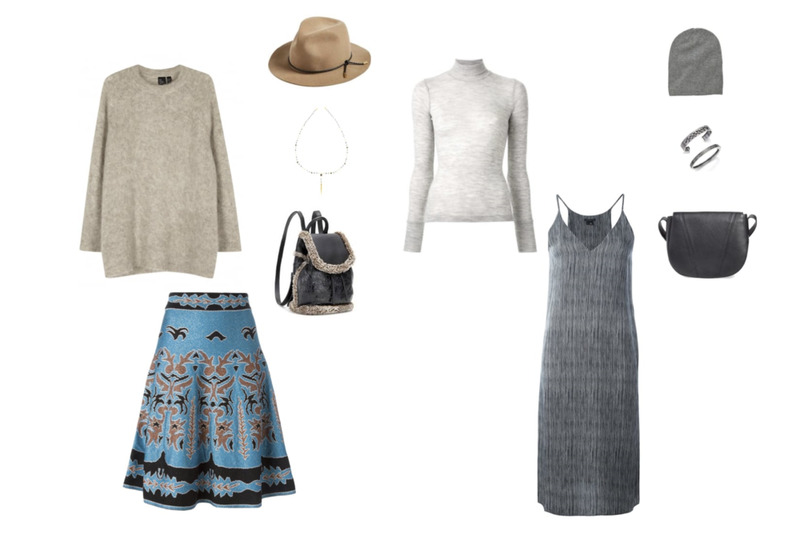 From L to R: Eileen Fisher sweater, M Missoni skirt, Rag & Bone "Abbot" fedora, Chan Luu necklace, Rag & Bone shearling backpack, T by Alexander Wang rib turtleneck, Theory "Kyon" dress, Hartford cashmere beanie, Rene Escobar bangles and Vince "Signature V" cross body bag. This is the perfect opportunity to mix colors and textures in unexpected ways, lightweight silks for Spring pair beautifully with a fuzzy sweater. Go bold with your choices, you won't regret it. Christmas is behind us and we're in the home stretch of the winter holidays, which means it's time to figure out what you're wearing New Year's Eve. Whether you're doing a low-key night at home with the kids, or headed to a big shindig with loads of friends, it's fun to plan a festive outfit to wear. New Year's Eve is a long night, so be sure to sport something comfortable, easy to dance in and of course chic! It's all about the jewels with these looks, go bold, and don't be afraid to mix metals and stones for an outfit with tons of sparkle. As always a vibrant lip and a sky high pump is a must for all three ensembles. Wishing you and yours a fabulous New Year. Stay safe and have fun! It's so exciting to see how different designers revive and reinterpret trends, especially when things gets a little retro. The 60's are making a bit of a comeback this season and many of our favorite designers have put their spin on all things Mod. It's easy to take this trend too far and land it costume territory, so it's important keep your accessories sleek and your silhouettes clean. Although we all don't have legs for days and the perfect fringe like our dream girl Alexa Chung, she is a good source of inspiration when it comes to keeping the Mod trend modern.